De Beers’ line of laboratory-grown diamonds, Lightbox, made its retail debut in the fall. Shortly afterward, GIA researcher, Dr. Sally Eaton-Magana, who has been identifying and analyzing lab-grown diamonds for 11 years, took a close look at the new De Beers-produced product for the Winter 2018 issue of Gems & Gemology. Lightbox diamonds are produced in quarter carat, half carat and full carat sizes in colorless, pink and blue, and are uniformly priced at $800 per carat. Eaton-Magana examined two colorless specimens of .24 ct and .26 ct, respectively. Both stones had color equivalent to G on the GIA diamond color scale, with cut grades of excellent and very good. Both were very high clarity, the equivalent of VVS2 on the GIA clarity scale. The smaller diamond had a pinpoint in a bezel facet, while the other had a tiny feather in a star facet. The laser-inscribed Lightbox logo (2 equilateral triangles base to base with an isosceles triangle in the middle) under the table – large enough to be easily visible with a microscope – would reduce the equivalent clarity grade to VS2. GIA Synthetic Diamond Grading Reports use ranges, rather than specific grades, to describe the color and clarity of laboratory-grown diamonds. Magana confirmed that the Lightbox diamonds were grown using the chemical vapor deposition (CVD) process, which means they are Type IIa with no detectable nitrogen. “The identification criteria for high pressure, high temperature (HPHT) and CVD synthetics can be quite distinct from each other,” she explained, adding that synthetic products have become much more varied over the last 10-15 years. Although Lightbox is new to the market, and the variety of lab grown diamonds is increasing, the fundamental identification criteria have not changed. They are based on growth morphology and optical properties. “We also regularly conduct research on emerging products and GIA has a program to grow synthetics ourselves to stay ahead of any new trends,” she said. Similarly, the basic equipment for identification has not changed. Researchers and grading laboratory staff continue to rely on microscopy, fluorescence imaging, absorption spectroscopy, and photoluminescence (PL) spectroscopy. What has evolved, she said, is the speed and efficiency of these devices. 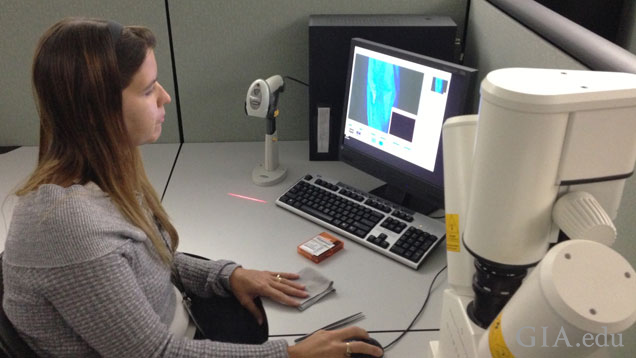 The evolution of PL mapping capabilities is important, she explained, because it enables GIA to collect thousands of spectra at micron-sized intervals across the surface of a diamond in mere minutes. She said that PL spectra showed the Lightbox diamonds were not subjected to post-growth HPHT processing to improve their color. The researchers noted that about 75% of all CVD-grown diamonds they encounter have been subjected to such treatment. This is because quite often these diamonds are grown with a brownish color, especially if the manufacturers attempt to grow them quickly. While the HPHT treatment process is effective in improving the color of CVD diamonds, the large amount of energy used to create sufficient heat and pressure can add significantly to the cost of production. The Lightbox products, however, are priced much lower than most other lab-grown diamonds in the market. Both diamonds showed visible red fluorescence in imaging by the DiamondView synthetic detector, but had no detectable fluorescence under long wave UV light. The lab-grown diamonds did show tell-tale CVD growth striations, but they were difficult to spot, requiring careful DiamondView imaging. Lightbox lab-grown diamonds are readily identifiable as CVD by spectroscopic techniques, DiamondView imaging and, of course, the inscribed logo under the table, her article noted. Magana earned her doctoral degree in chemical engineering with Dr. John Angus, one of the early pioneers of CVD synthetic diamond growth. For her Ph.D. and post-doctoral work, she worked mainly on growing CVD synthetics for engineering and semiconductor applications. Lightbox, a De Beers company, has begun selling “white,” pink, and blue CVD laboratory-grown diamonds at a flat rate of $800 per carat. Dr. James E. Shigley describes the means of distinguishing colorless and colored synthetic gem-quality diamonds from natural diamonds. What exactly are man-made diamonds? Find out how they compare to natural diamonds and what you should know.